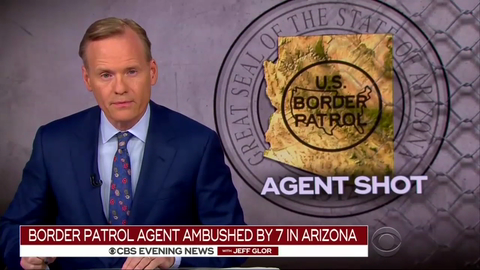 On Wednesday, CBS News was the only broadcast network in the big three (ABC, CBS, and NBC) to inform their viewers of an ambush on the U.S.-Mexico border that left a Border Patrol agent in critical condition. By their evening broadcast, CBS reported that the agent was upgraded to stable condition but their broadcast competitors ignored the shooting altogether. They instead chose to hype the social media phenomenon of a raccoon that scaled a building in Minnesota. For their evening newscasts, ABC wrapped up World News Tonight by spending one minute and 32 seconds on the raccoon, while NBC Nightly News spent one minute 25 seconds on the animal. During CBS Evening News, the network didn’t touch the raccoon story at all and gave the Border Patrol agent shooting the serious coverage that it deserved (one minute and 49 seconds). “Now to a remarkable story of survival. A Border Patrol agent is in stable condition after being shot several times at close range he was on patrol, alone and on foot when he was attacked early yesterday,” announced John Dickerson, who was filling in for anchor Jeff Glor. “In a desolate part of southern Arizona near the Mexican border, a lone agent investigating activity picked up by sensors was ambushed,” reported Mireya Villarreal. “The 21-year veteran is also a trained paramedic and treated his own gunshot wounds.” She also recalled FBI crime statistics that found “assaults on [Border Patrol] agents averages 428 per year”.